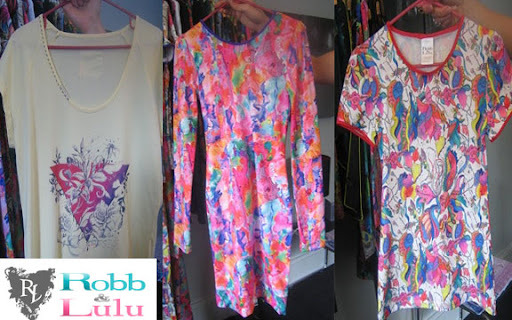 About: Robb and Lulu both used their skills of fashion design and illustration to create unique designs and fabric creations for their label. Robb and Lulu has a range of pieces for men and women but the stand out element of the collection is the highly colorful and detailed illustration prints that is all hand sketched. With only one collection under the label's belt, some of the pieces has caught the attention of major retailers here in the States. About: Only 8 years old, Oscar the Third is an organically grown collection, that has many references point from around the world. Jessian works with a specific farm in South India that produces the organic cotton that she uses for Oscar the Third. The label focuses on hand dyed fabrics, flirty dresses and chunky knits. The brand is growing and garnering attention much with the Australian press. About: WISH was established by the Sydney fashion pack and it definitely has all of the elements; ultra feminine, utilitarian, edgy basically everything a city girl needs. WISH produces a jam pack six collection a year, Smokey Shadows their recent collection just hit stores. The collection has wearable skirts dresses in nudes and prints that is perfect for the summer time. About: Maurie & Eve is an Australian label based on a story of love. The story of Maurie and Eve, is that Evelyn Williams and Maurice Williams met each other on a beach and fell in love and was together for 56 years. Kelly Davis, the designer started designing clothes on the sewing machine that her grandmother, Evelyn left to her in her will. It was only right that Kelly name the label in honor of her grandparents, Evelyn and Maurice. Currently being produced in Bali, Kelly uses the top of the line fabrics such as suede and sheep leather for her label. Maurie & Eve is the quintessential of the two worlds of being edgy and feminine; there are many elements of boyish quality with a balance of feminine shapes. More than 9 years later the brand as emerged out of Australia and into other major markets around the world. About: Beginning her career at the ripe ol' age of 17 it didn't take that long for Jessie to get recognize to be head womenswear designer at Buddhist Punk, a label located in London. Soon after her stint there she ventured on on her own with her namesake label. Jessie Hill is a mix of naughty and nice, sweet and spicy. Jessie's know how to balance her edgy sensibility with sophistication which makes it perfect for that hipster customer. About: Goddess of Babylon is where bohemian lives and thrives. Chantel Barber, head designer gets her inspiration from Bali, Indonesia and Byron Bay, Australia. These are two places that the cultures are uniquely different but consolidated together makes a collection very grounded and earthy. Each season the collection have the basics of organic cottons, leather, suede and details in pieces that are handstitched. About: This namesake label is all about what a every day woman wants to wear. Marnie, the designer knows a thing and two about making clothes for the chic sophisticated women. Her first collection debuted at Australian Fashion week and since then she has evolved her collection around tailored pieces. Marnie uses her design training and experience to infuse modernity, shapes and luxe fabrications as her signature each season.